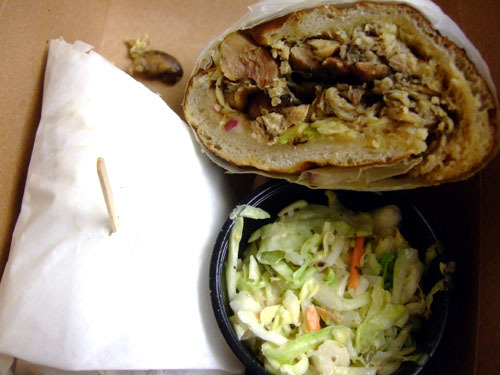 A native of Northern California, Beachwood BBQ's owner Gabriel ("Gabe") Gordon had been exposed to fine dining from a relatively early age, and after working at a number of top Southern California restaurants, Gordon planned to open his own haute cuisine place in Orange County with wife Lena. 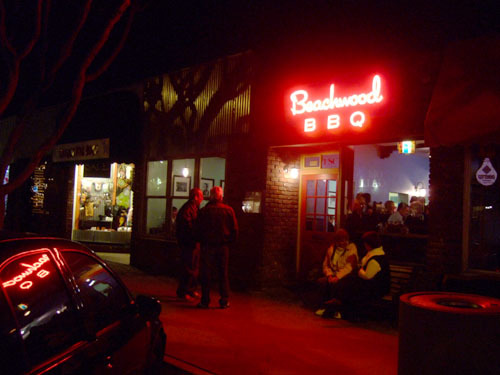 But after surveying the OC's culinary landscape, Gordon decided that what the county was missing wasn't another fine dining restaurant, but rather a good barbeque place, and thus the concept behind Beachwood BBQ was born. 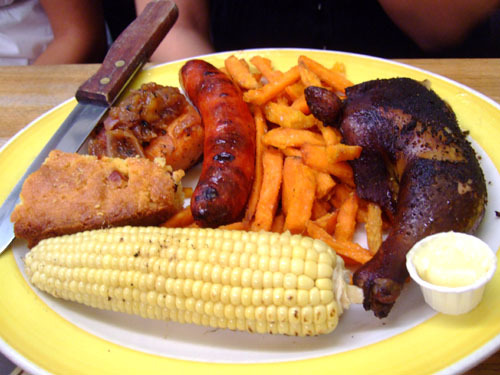 If there's one type of cuisine that Americans get up in arms about, it's barbeque. The BBQ tradition in the United States is rich, especially in the southeast, where it's not merely a way of cooking meat, but practically a way of life. 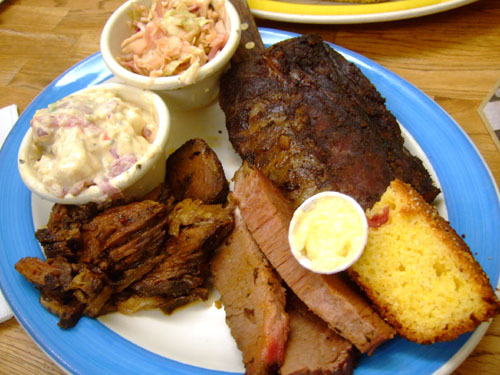 The types of BBQ practiced throughout the country are vast and varied, but are typically broken down into four dominant styles: Carolina, Kansas City, Memphis, and Texas. Beachwood is influenced primarily by the "dry" Memphis style. 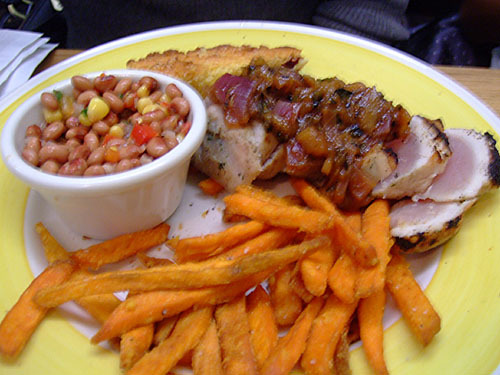 Meats here are dry-rubbed and slow-smoked, sans sauce, to preserve their natural flavor. 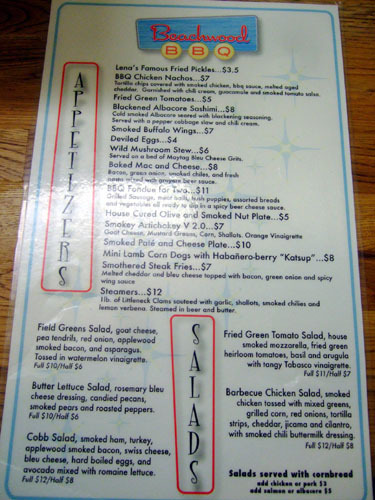 Located in quaint downtown Seal Beach, not too far from A Slice of New York, Beachwood started out at only half its current size--basically the half of the restaurant under the "Beachwood BBQ" sign--but soon expanded, taking over the space to the left of the restaurant. This lessened wait times, but more importantly, allowed Gordon to install a bar. Russian River Damnation [$6.50] - I told Gabe of my penchant for Belgians and asked him to surprise me. He came back with Damnation, from Russian River Brewing Company in Santa Rosa, CA. A great way to kick things off, this was an herbal, spicy beer, crisp at first, but going down smooth, with a bit of hop on the finish. Kasteel Tripel [$6.50] - From Brouwerij Van Honsebrouck in Ingelmunster, Belgium. This was my favorite beer of the night, showing a fruity nose of apple and pear, which continues onto the palate. Light, cidery, yeasty, with just a bit of heat on the finish. Affligem Blonde [$6.50] - A strong pale ale from Brouwerij De Smedt in Opwijk, Belgium, this was somewhat less complex than the two beers above, with a hoppy bitterness, plenty of tart citrus, and a bit of spice. Finishes light and dry. In addition to these three beers, I also got to sample my dining companions' selections, including the: Paulaner Hefeweizen [$5.50], Warrior Black IPA [$6.00], Calico Amber Ballast Point [$5.50], Abandon Ship Smoked Lager Ballast Point [$5.50] (reminded me of the Stone Smoked Lager), Koningshoeven Quadrupel [$6.50] (superb), Stone Russian Imperial Stout 2008 Cask [$7.00] (super thick, like espresso! 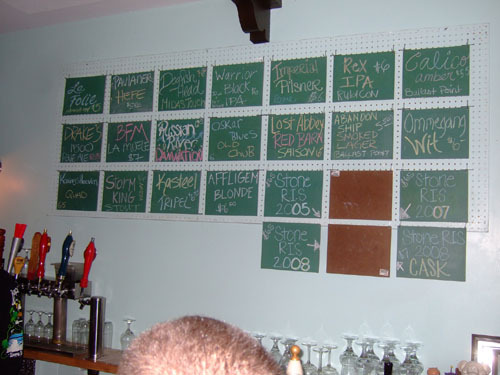 ), and Rex IPA Rubicon [$6.00]. Particularly noteworthy was the Paulaner. In addition to being a superb Hefeweizen, I was able to try it mixed with cola, making a so-called "Colaweizen," which apparently is popular in Germany. It was actually quite delicious, with the cola being surprisingly apparent, resulting in a heavier, sweeter, more viscous drink. 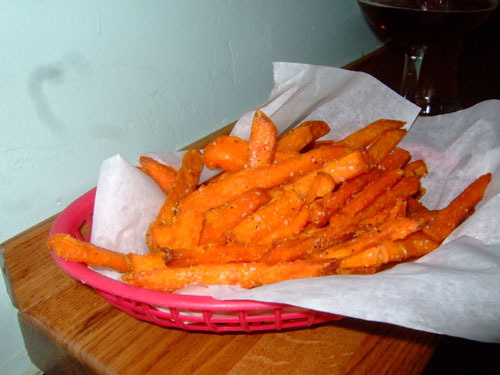 While we were waiting for our table (no reservations are taken), we ordered a basket of sweet potato fries, which I'd had only one other time, at The Counter in Santa Monica. Fortunately, the fries here weren't quite as sweet as The Counter's, and were coated in quite a bit of salt. Not bad, but I'll stick to regular fries next time. After a very long wait, we were led to our table in the main dining room. 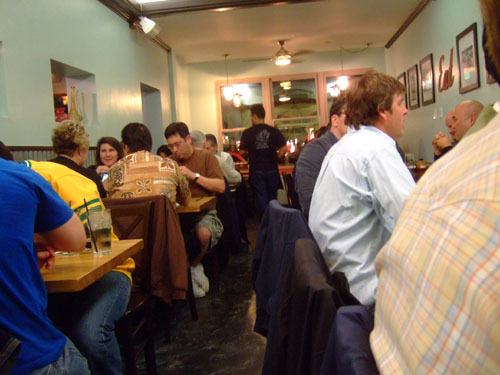 The delay wasn't Beachwood's fault, but rather that of the customers before us, who lingered around for an inconsiderably long time after their meal. Though focused on BBQ, naturally, the menu does provide a decent selection for the non meat eaters out there as well. Click for larger versions. 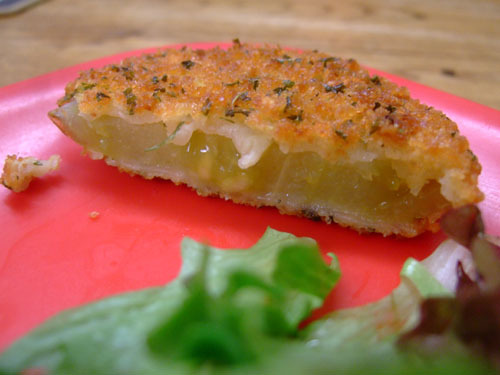 Whenever I hear the term "fried green tomatoes," I think of the 1991 film starring Kathy Bates, Mary Stuart Masterson, Mary-Louise Parker, and Jessica Tandy--perhaps not the most appetizing visual imagery. But in any case, fried green tomatoes are a traditional southern side dish, and this was actually my first time having them. 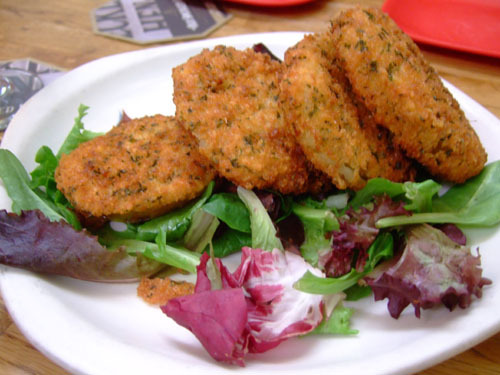 The tomatoes are coated in cornmeal and fried, resulting in crunchy, peppery exteriors that contrast nicely with their sweet, soft, juicy interiors. Quite good! 1lb. 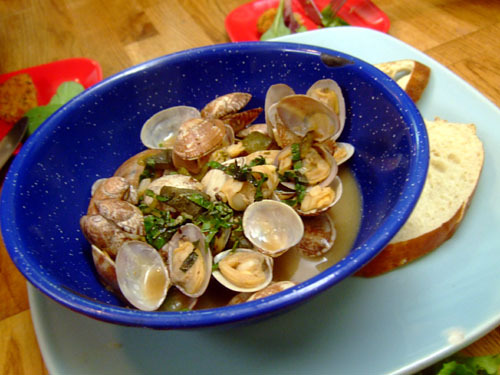 of Littleneck Clams sautéed with garlic, shallots, smoked chilies and lemon verbena. Steamed in beer and butter. 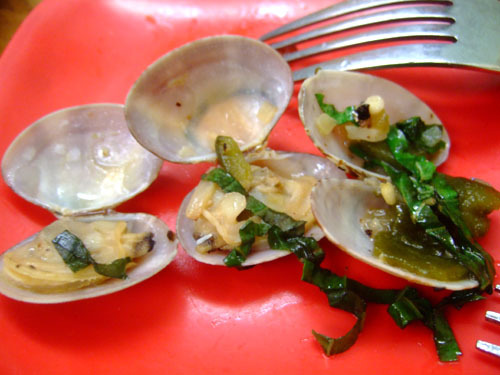 These were excellent, some of the best clams I've had in fact. They were soft, juicy, but still slightly crisp, soaking up wonderfully the flavors of their rich, tangy, garlicky broth (which I subsequently sopped up with the provided bread). Bacon, green onion, smoked chilies, and fresh pasta mixed with gruyere beer sauce. 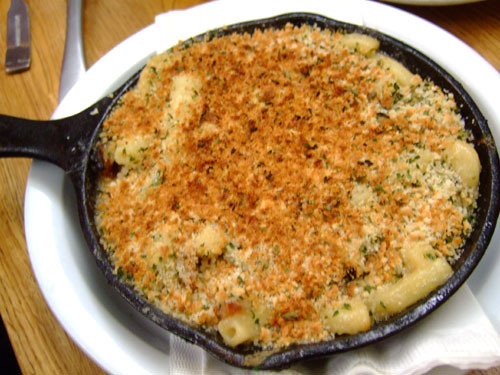 I'm quite the fan of mac and cheese, and I really appreciated the use of gruyere and beer here, along with the perfect texture of the macaroni itself. Unfortunately, the dish was too "gritty" due to the toppings, and I found the bacon superfluous. They made this dish fancier than it needed to be. Although Beachwood proudly proclaims that its BBQ is good enough to stand alone without sauce, four are available, if you insist. 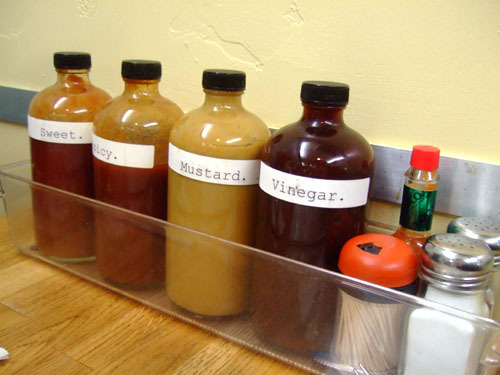 They're named simply: Sweet, Spicy, Mustard, and Vinegar. This was my plate. All meats were dry rubbed and slow smoked with applewood, pecan, and oak. I first tried the short ribs, which were immensely tender and fatty, with an intense smoky sweet flavor. I appreciated the alternating sections of tough, caramelized crispness and soft, juicy tenderness, which actually reminded me of carnitas. Next was the brisket, which was among the most delicate preparations I've had. The meat was dry, lean, and mild in flavor--a bit too mild for me, in fact. Finally, we got to the baby back ribs. I quite liked the texture here, not quite "falling off the bone"--tender but still with a bit of bite, with a nice interplay between fat and lean. I just wished there was more meat on them bones! As for the sides, the tangy coleslaw lived up to its name; it had a lip-puckering dressing that beautifully complemented the crisp veggies. I liked the potato salad even more, which was probably the zestiest, sharpest version I've tasted, with strong onion notes and plenty of tang as well. I convinced one of my dining companions to order a combo plate as well, so we could share and try a variety of meats. First up was the smoked chicken. It was indeed very juicy, moist, and tender, but most of the BBQ flavor was concentrated in the skin, not the flesh, which was fairly ordinary. I much preferred the sausage, which had a great snap on the casing, a beautiful consistency, and a delicious, spicy flavor. As with the meats above, both the chicken and sausage were dry rubbed and slow smoked with applewood, pecan and oak. The fish, on the other hand, was cold smoked with oak and finished on the grill. The salmon was nicely cooked, producing a soft, juicy, flesh flavored with smoke and wood, along with a delightfully crisp, flavorful skin. The only problem was the onion topping, which was far too sweet, drawing attention away from the natural flavor of the salmon. One of my dining companions order a boar (wild ancestor of the domesticated pig) meatloaf, but unfortunately, I forgot to try it. 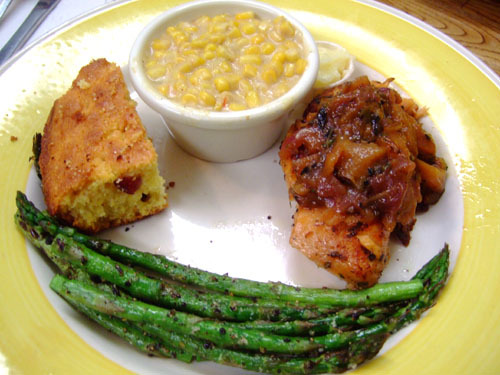 Note that all plates come with cornbread. Salmon again. I got to try the corn and asparagus, both of which were quite tasty. Like the salmon, the albacore was also cold smoked with oak and finished on the grill, though it wasn't nearly as interesting. Cooked rare, the albacore had a dry, firm texture, along with a mildly smoky flavor. It also came with the salmon's sweet onion topping, which again, didn't work for me. 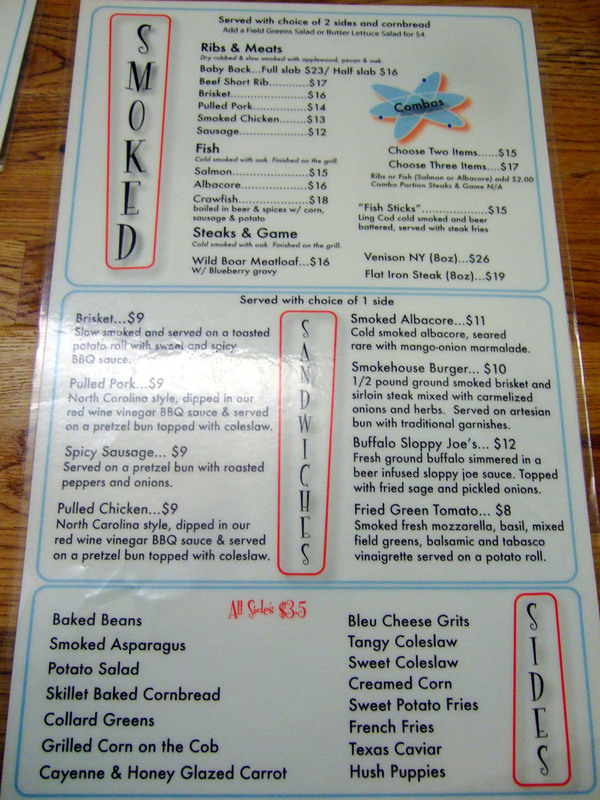 I came out of Beachwood with a positive impression, though admittedly, I don't exactly have much experience with BBQ. And certainly, the fantastic beer, and equally impressive company must have something to do with it as well. Nevertheless, I quite enjoyed most everything I had, and truth be told, barbeque was a refreshing change of pace for me. I guess I really did like the place, as a week later, I went back to Beachwood, and picked up two of their sandwiches to go. Both sandwiches were done North Carolina style, dipped in red wine vinegar BBQ sauce and served on a pretzel bun topped with coleslaw. First up was the pulled pork. 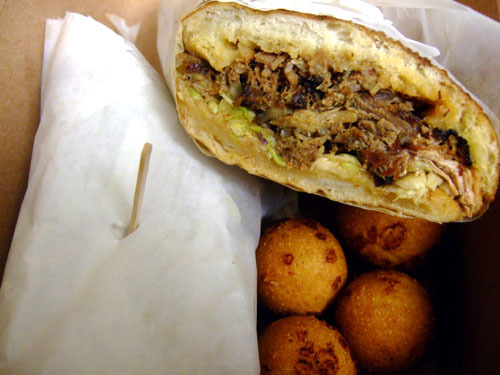 Now this really had the "crunchy outside-tender inside" consistency of carnitas. Unfortunately, its fabulous texture was marred by its sweet flavor, which overwhelmed the sandwich in my opinion. The chicken was much better in this regard. 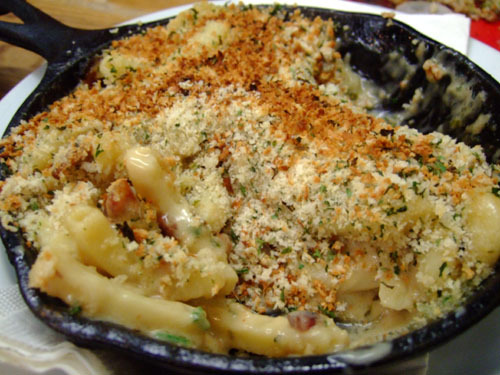 It had a smoky, savory flavor that was perfectly complemented by the crunchy veggie topping. 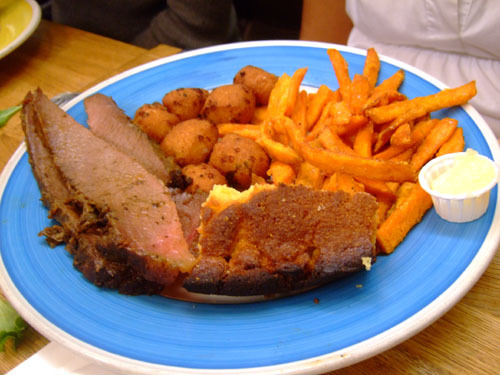 As for the sides, I wasn't a fan of the hush puppies, which were extremely dry and rather tough--perhaps they'd be better fresh. The sweet coleslaw was better, though definitely more of a traditional preparation compared to the tangy version I had earlier. i am a fan of the meat being able to stand on its own. usually think sauces are meant to disguise tough unflavorful cuts. that meat combination plate looked a bit small for 19 bucks. everything looked tasty though. Paul, I definitely agree about the sauce. I wasn't hungry after the meal, but had it not been for all the apps and the beer, then I think I might've been. Wow! 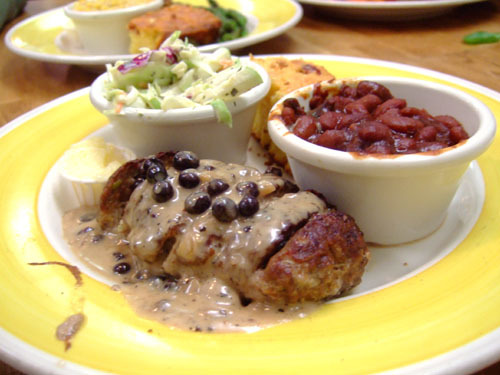 Wild Boar Meatloaf with Blueberry Gravy... Fried Green Tomatoes (killer photo)... and Littleneck Clams? My kind of BBQ for sure! Can't wait to try this place. Thanks! Jo, so do you have any recommended places for BBQ in LA? Hey Kevin, I don't even live in LA, but I enjoy keeping up with your blog. I wanted to point out that Russian River Brewing Company is from Santa Rosa, CA, and not from Santa Clara. If you have a chance, try out their double IPA called Pliny the Elder as well. Russian River has a great bar in town, and I always start with a Pliny! Thanks for the correction Andrew! Too many "Santas" here in California. ;) In any case, they do certainly make some great beer. Wow that looks great. I think the Mrs. and I are going to have to add a Seal Beach restaurant to the list. 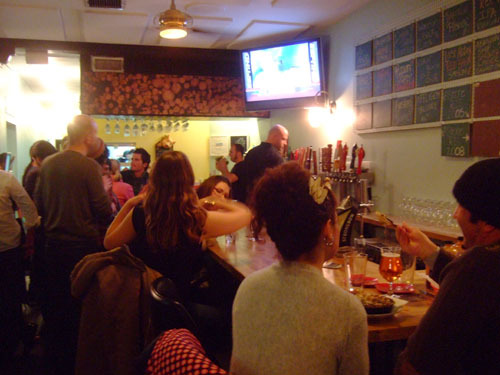 Yep, Beachwood is definitely worth checking out if you're looking for BBQ! One of my friend had always talked about this place as the place to go for BBQ down there near the Belmont Shore. BTW, did you tried their fish & chips? The fish is a from smoked link cod that is battered with different beer at different week. She said that is to die for at Beachwood. Yum, now I want to go! 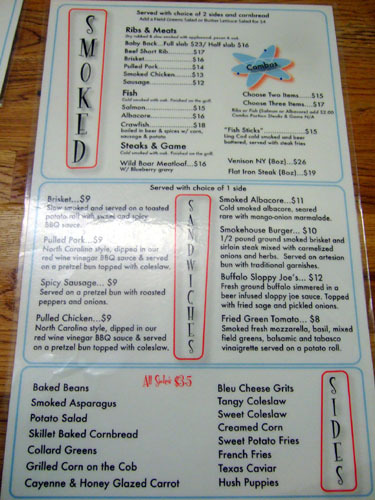 Mike, I didn't get to try the fish "sticks," but now that you mentioned it, I'll get it next time. It's been a while since I've had a good fish & chips.